Please note: this magnificent creature is not a member of the Tribe, but lives with his blobs, Maureen and Paul, in Kent. Last year, Mort picked a fight with a car and got off with nothing more than a few bruises and a few grazes on his face. This year, Mort decided to pick a bigger and better fight with a car. Although he looked fine from the outside, our long-suffering vets thought he might have a dislocated or fractured pelvis and either a haematoma or a tear in his abdominal wall. It turned out that nothing is broken or dislocated but Mort, not a cat to do anything by half measures, had not one but two hernias, and his internal organs were partying in places where they shouldn’t. Not that you’d have noticed if you’d watched him climbing the cats’ activity centre. Our vets performed an epic operation and spent several hours stitching Mort back together again and everything is back where it should be. Mort is now recuperating at a veterinary hospital in Maidstone, where he is reported to be doing very well, purring his head off, when he isn’t eating. We hope he’ll be home in the next day or so. He’s also racking up an impressivels scary set of vet’s bills – over £1500 already and we don’t have the final totals yet – which is worrying for us as Paul was made redundant when his employer went into administration last year and we’re relying on his smallish pension and my income from editing to keep us going. 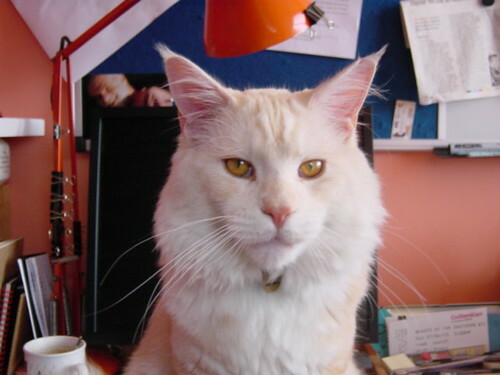 Various kind people have expressed an interest in helping with Mort’s bills – this page provides a link to my PayPal account for those who want to contribute. You will needless to say earn our undying gratitude, visiting rights if you’re in the vicinity, and we promise to keep Mort away from roads, even if it means kitty jail for the rest of his life. Thanks, also, to Mac and Pete Jordan for hosting this page and helping with the clever technical stuff; to everyone who has provided moral support this last week or so; to Manor Vets in Folkestone for sewing Mort back together again, and taking so much time and care over ensuring his well-being; and to Newnham Court Veterinary Hospital, Maidstone for ensuring that Mort has stayed stitched together. Not much, but I hope it helps. Mort is a beautiful cat!